Successful online programs require data automation and integration between business and learning systems. For some programs, connecting the CRM (Salesforce, Microsoft Dynamics 365, etc.) and the LMS (Canvas, Blackboard, Cornerstone, etc.) is all that is needed for student success. Larger programs typically require additional data integration with marketing and analytics. For many online programs, student success is customer success. Automating the process of online registration, enrollment and course outcomes between the LMS and CRM has never been easier. Lingk provides Speed Wizards for simple synchronization and SQL Recipes for sophisticated data automation and transformation processing. Lingk provides a wide range of Connectors from top LMSs, CRMs and online registration systems (like LearningStream) to enable a best-of-breed online program. When the CRM is at the heart of engagement and business transactions for online programs, adding data from the LMS provides the product usage data needed to identify retention risk and to correlate outcomes to recruitment and admissions. When there is more data to be captured than what a CRM can handle, you will want to store your data in a data warehouse or data lake. The Lingk Data Platform provides the pipelines to move data to data warehouses and data lakes. When you incorporate a data warehouse or data lake into your online program, you want to capture as much data as possible from all systems that engage with a student. Whether data is unstructured real-time activity feed data or slowly changing structured contextual data, Lingk provides tools to ensure your next reports and dashboards provide the insights required for better data decision making. The LMS, which is actually an administrative and compliance application, is moving into the world of ERP and a new category of software for employees has emerged, something that industry analyst Josh Bersin has called the Learning Experience Platform (LXP). There are more than 500 million working professionals in the world and nearly a billion employees of various types (gig, part-time, blue collar, temporary). All of them need to learn at some point in their job (onboarding, compliance training, or simply training to learn how to use the tools of their trade). LXP software is to learning what middleware is to applications and needs to integrate with the corporate learning and education digital ecosystems. Lingk can help you connect with industry technology ecosystems. Using Lingk can give you a strategic advantage over other options. 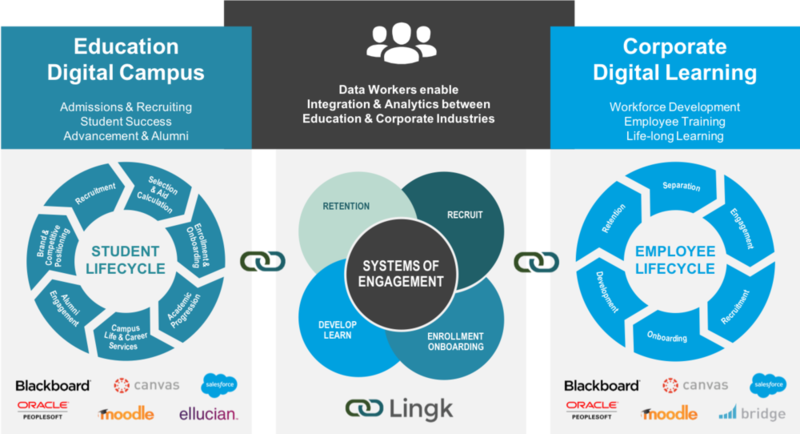 The grid below outlines the central concepts of Lingk and how we are different to give your organization strength in a competitive marketplace.